On Friday, group of students and teachers from my English school attended a day trip to Tokyo to view Sakura. 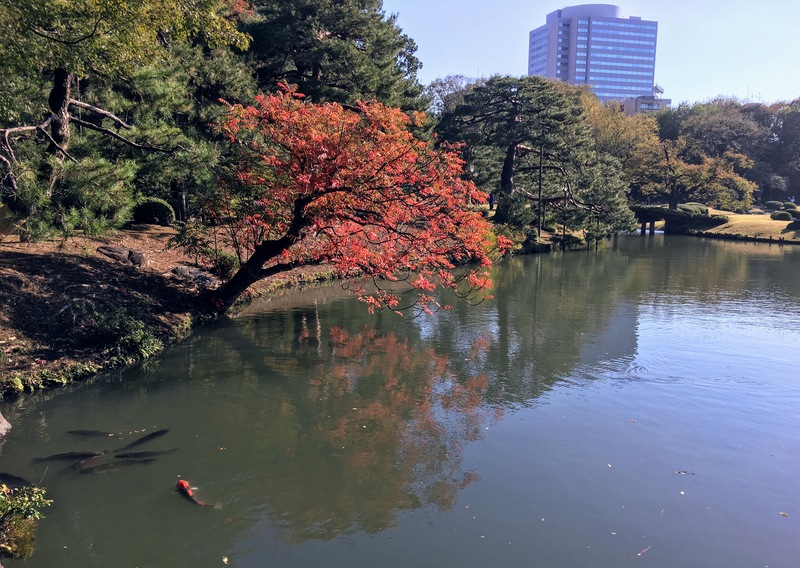 Our first stop was at Komatsugawa Senbonzakura, a park on the east side of Tokyo. I have never been to this area of Tokyo. I took a screenshot of Google Maps and the dropped pin. The park is saved with the pink heart on the right side of the photo. To return to this spot would take about two hours from our house and at least three trains. I was glad it was part of the tour because, I definitely wouldn’t have gone on my own. As we walked around the park, one of my students told me the park was only about 15 years old. So, the trees were not very big. Size certainly didn’t matter in this case. The trees were beautiful. The weeping Sakura was my favorite in this park. In the picture with me are two of my English students who attended the school trip. It was fun to see so many people out enjoying Hanami. Now that’s a playground! Complete with a net to climb and a roller slide! 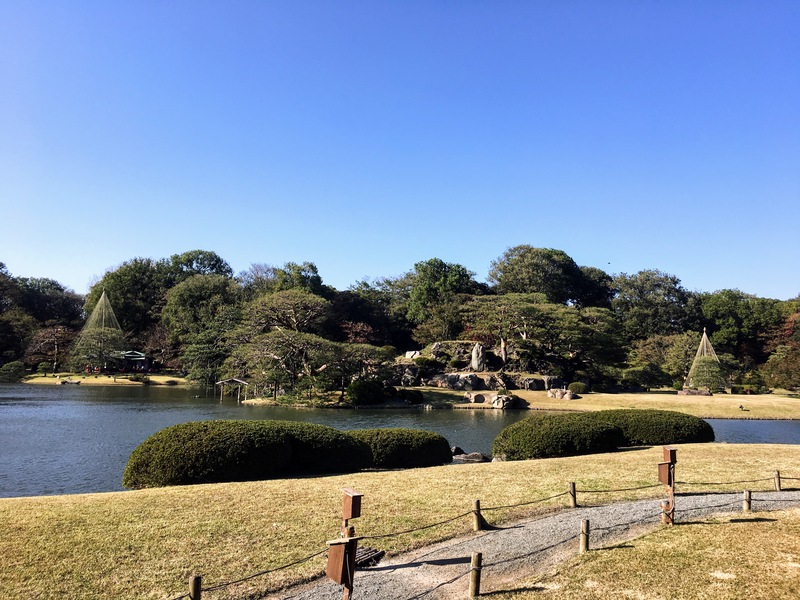 The second stop was at Rikugien Garden. 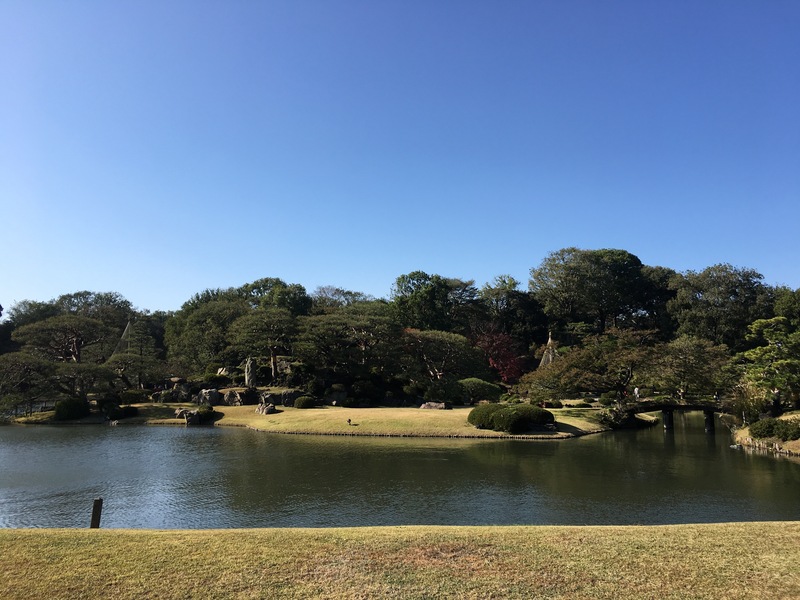 I visited Rikugien Garden this past November. We were a little too late to view the main Sakura attraction. The large Sakura tree had already dropped its petals. There was still plenty to see in the garden. It was so quiet and peaceful. 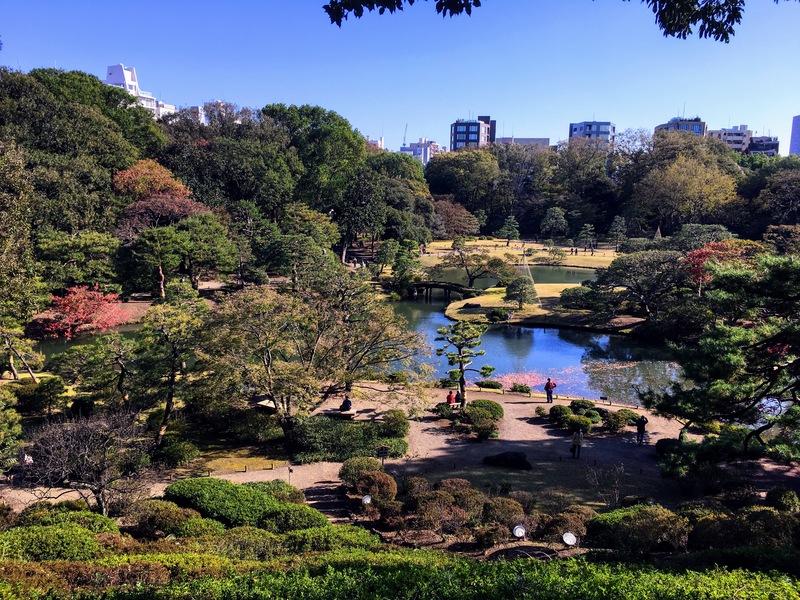 It’s always hard for me to believe I’m in the middle of a huge city when I visit gardens in Tokyo. There is very little city noise. Our third stop of the afternoon was at the State Guest House of The Asakusa Imperial Property. The State Guest House is where national dignitaries are hosted when they visit Japan. We toured the inside of the property, but were prohibited from taking photos. The building was beautiful. Again, I was glad it was part of the tour because I probably wouldn’t have gone otherwise. I was able to take a few pictures of the garden. The fountain reminded me of the Buckingham Fountain in Chicago. Our final stop was at Chidori-ga-Fuchi. 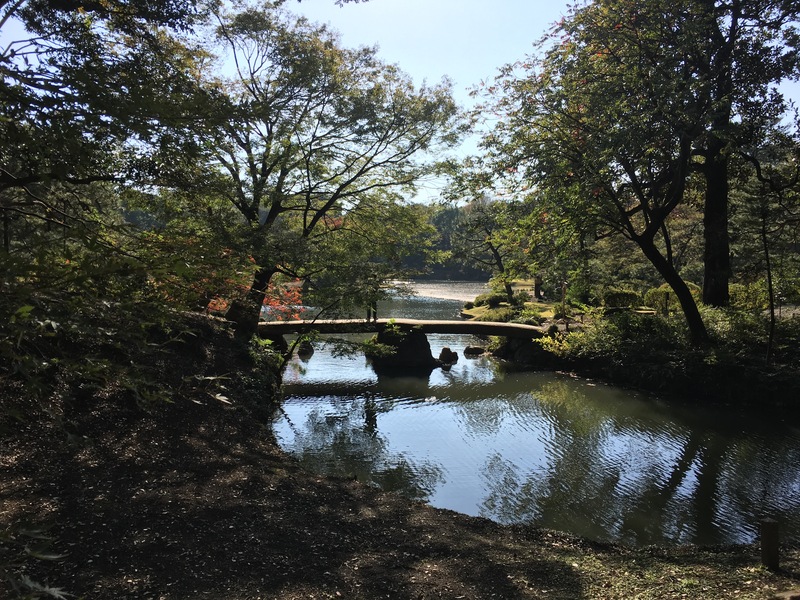 Chidori-ga-Fuchi is a large moat surrounding the Imperial Palace. Visitors are permitted to rent row boats and paddle around the moat. The row boats and Sakura made for beautiful pictures in the afternoon sun. The trip was planned in early March. There was no guarantee the Sakura would be blooming or the weather would cooperate. I think we were very fortunate to have beautiful weather and blooming Sakura. Thursday was another beautiful Autumn day that warranted getting out for a little leaf peeping. I caught a morning train to the Bunkyo area on the north side of Tokyo. Once again, I arrived with an onigiri and was able to eat lunch at the garden. Simultaneously, thanks to modern technology, I could chat on my phone untethered to wifi and for free with my friend Sara in the U.S. all while sitting on a bench in a Tokyo garden. It was great catching up with you, my friend!! Now, back to the beautiful garden. 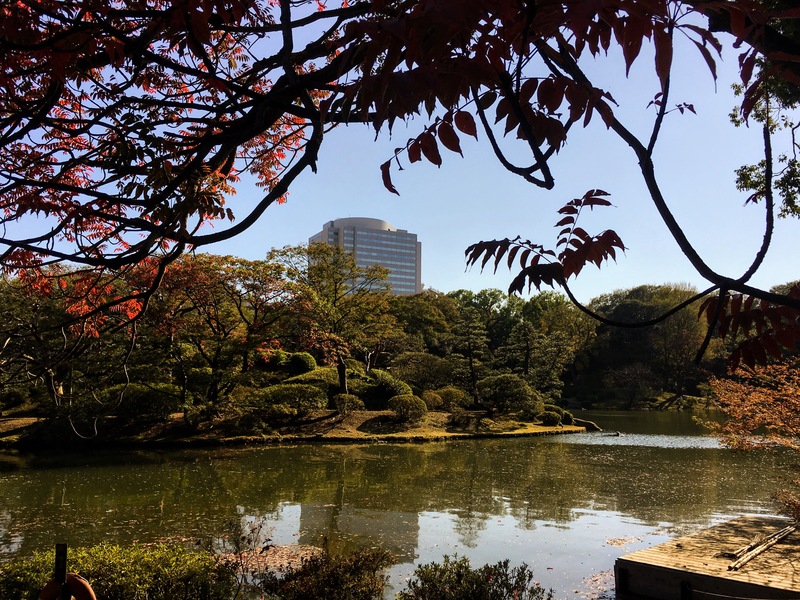 The Rikugien Garden is a traditional Japanese garden. The garden highlighted the natural landscape of the area and incorporated water elements. This small section of water was actually part of a very large pond. 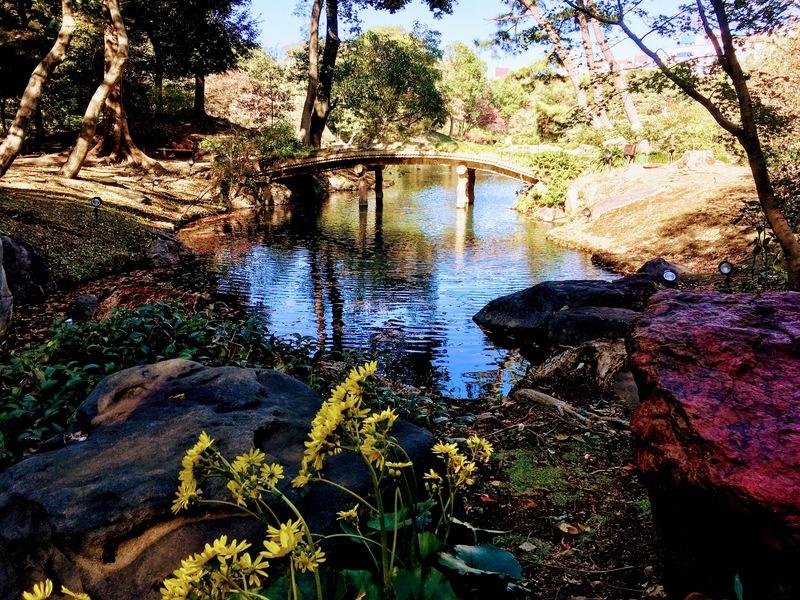 Bridges over the water are also important elements of a Japanese garden. Here is the pond from another angle. From this picture, you can see the large size of the pond. Another part of a traditional Japanese garden pond, is the presence of koi. Check out the giant orange koi and group of dark ones on the left side of this picture! I spent about an hour and a half wandering through the many paths within the garden. One path took me up a small hill. The view from the top was beautiful. I was a little early to see the peak Autumn foliage. Instead I only had a peek. Another path took me along the back of the pond. It was so quiet and serene. The island is also an important part of the traditional Japanese garden. Typically, entry to the island is not permitted. 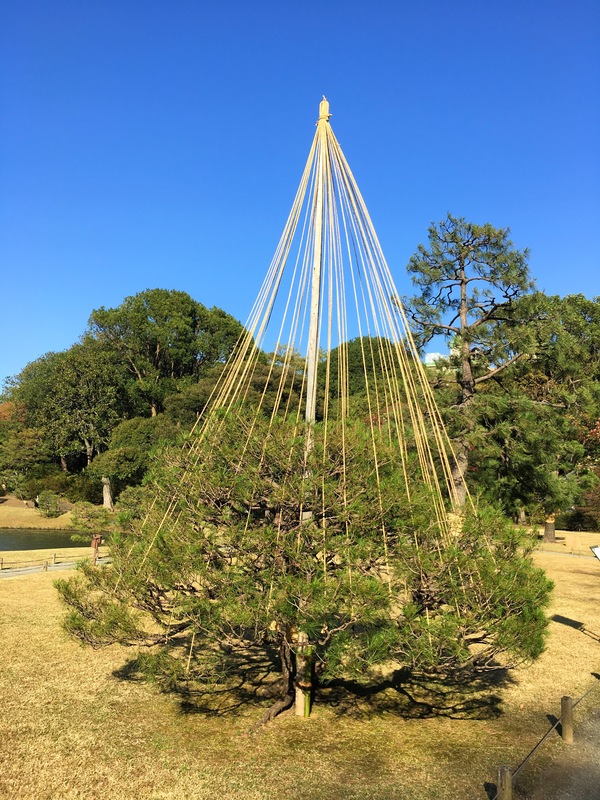 The large island in Rikugien is made of weathered rocks with a single pine tree. This island represents Mount Horai, the legendary home of the Eight Immortals. I took a close up picture of the bridge to access the island. 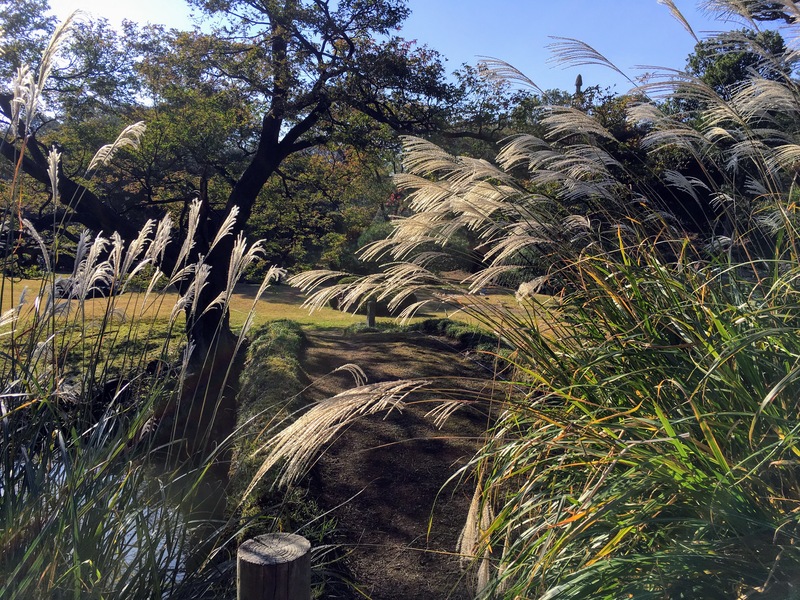 The Obana (Japanese pompas grass) is one of my favorite signs of Autumn in Japan. 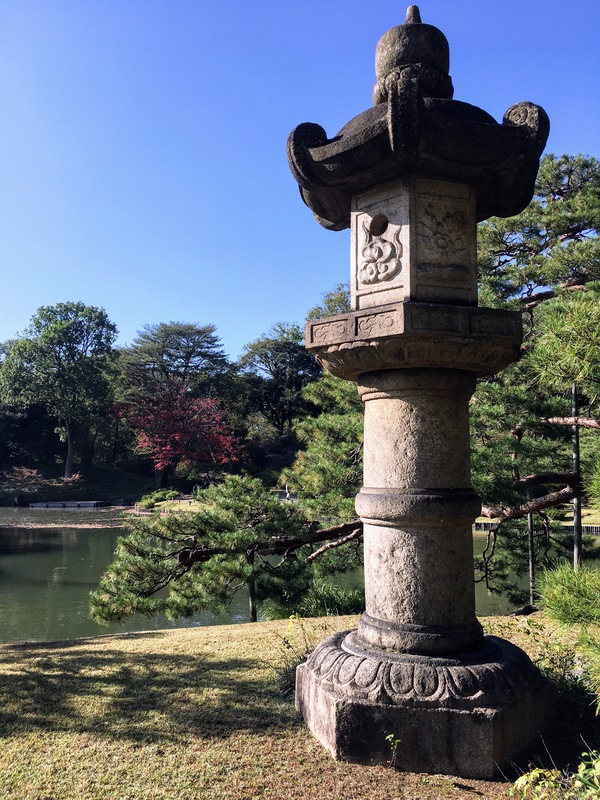 Stone lanterns are also significant in a traditional Japanese garden. Originally, they were used to line the path to a shrine. Within the garden, they are decorations used to remind visitors of the passing of time. I truly enjoyed my afternoon. Please don’t get mad at me for saying this, I’m starting to get into the Christmas spirit! I know, it’s not Thanksgiving yet. However, the Japanese don’t observe Thanksgiving. Instead, it’s straight to Christmas and Christmas decorations. Christmas decorations are starting to appear everywhere and I just can’t help but get excited when I see this Christmas tree!